Ever since I was a small boy, granola has been one of my favorite cereals. My parents encouraged me to eat it for health reasons, but I just loved the taste. I’m sure my parents were thrilled to feed me granola rather than an onslaught of sugary, artificial cereals. Fast-forward 20 years or so, and I still like granola. It’s healthy, and it gives me energy to make it through the morning. I also enjoy it mixed with yogurt and fruit as a quick snack. Granola is also one of the most expensive cereals in my grocery store. A 28-ounce box of Quaker brand granola costs $5.90 around here. If you go for the organic variety, it’s even more expensive. The high price made my wife and I wonder about the cost of making granola from scratch. Would it be worth the effort? The answer is an emphatic maybe. If you don’t regularly add granola to your grocery list, making it from scratch probably isn’t worth the effort. I think making homemade granola is worthwhile for a few reasons. First of all, if you really like granola, then making it from scratch is cheaper. Second of all, it’s easy to tailor it to your desires. Like coconut? Toss a few extra pinches in there. Think raisins are disgusting? Don’t add them. Thirdly, I’m a rabid label reader in the grocery store. If I don’t recognize the ingredients, or if I question their usage, I won’t buy the product. Most of the granola packages in the store have questionable ingredients. Hydrogenated oils? High-fructose corn syrup? Extra sugar? C’mon. That’s just unnecessary. Making your own granola is not only cheaper in the long run, but you get the personal satisfaction of knowing exactly what’s in it, customizing the flavor to your taste. Best of all, it’s far easier to make than you might think. Naturally, there’s some flexibility here. Feel free to eliminate the raisins if you don’t like them. 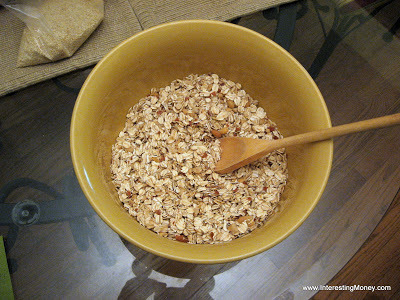 You could also substitute a different kind of nut, such as pecans. Feel free to substitute or add ingredients to your own taste, such as dates or other dried fruit. 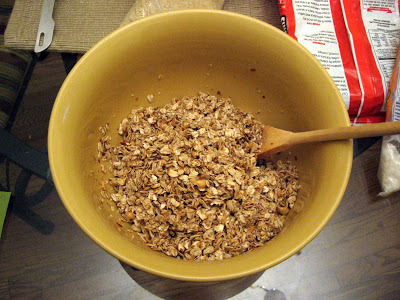 One homemade “batch” of granola yields about 28 ounces, comparable to a large store-bought cereal box. Let’s get started. 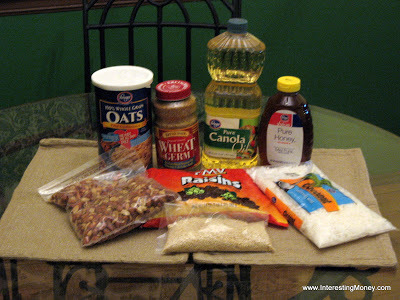 The first thing to do is mix together the dry, non-fruit ingredients, namely the oats, peanuts, sesame seeds, and wheat germ. Hint: chop up or crush the peanuts for best results. Next, add the wet ingredients (honey and oil) and mix together. Alright, we’re done with the preliminary work. Now it’s time to bake! 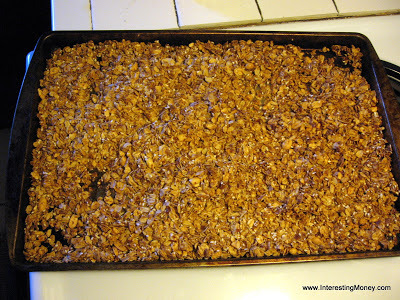 Spread the mix onto your favorite baking/cookie sheet (with a lip). Smooth it with a spoon until it’s even. 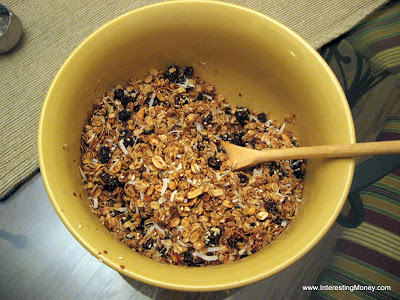 The last step is to toss in the remaining fruity ingredients, such as the raisins and coconut. Mix together thoroughly. Allow it to cool, and congratulations! You’re finished! Of course, you need to find a place to store your homemade granola. My wife and I have a metal tin that works nicely, but feel free to improvise. Yum! Doesn’t that look delicious? Aside from the baking time, putting the batch together took very little time and energy. I estimate that the entire process took 45 minutes, start to finish. How much will making homemade granola cost you? Let’s take a look. Naturally, there’s a lot of wiggle-room here since prices may vary widely depending on the store and the region, but here’s what I paid at my nearby Kroger grocery store. As you can see, the most expensive item on my list is wheat germ. If I leave it out, I would only pay $23.89. 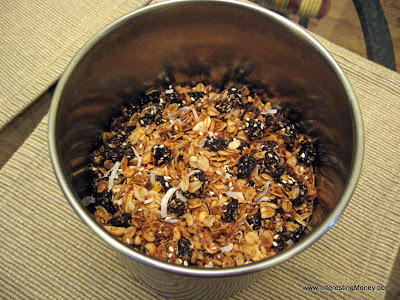 As I mentioned, one “batch” of homemade granola yields about 28 ounces, so the first batch cost me about $1 per ounce (or about $0.85 minus wheat germ). In comparison, one 28-ounce box of Quaker granola costs $5.90 at my grocery store, or about $0.21 per ounce. Yes, the Quaker brand is much cheaper compared to the first batch, but let’s see how it compares after several more batches. 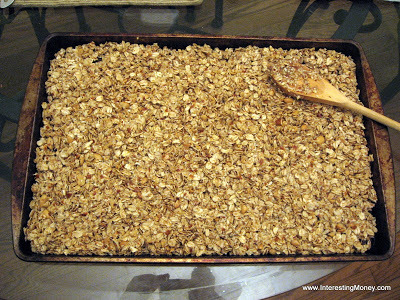 To make my second batch of granola, I don’t need to buy ANYTHING! I still have plenty of leftover ingredients, bringing my total cost down to roughly $0.50 per ounce (or $0.43 without wheat germ). Getting better. For my third batch, I only need to buy oats again, bringing the total cost down to about $0.35 per ounce (or $0.30 without wheat germ). 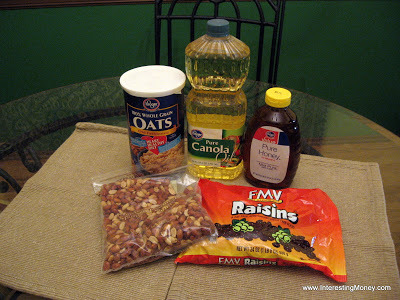 Now I only need to buy raisins, bringing the total cost down to about $0.29 per ounce (or $0.25 without wheat germ). It’s still more expensive than the Quaker brand right now, but if we continue this pattern…. By this point, I will have only had to buy oats, raisins, and peanuts again, and my effective cost per ounce is down to about $0.14, or $0.13 without the initial wheat germ purchase. In other words, I’m saving about $2 per batch compared to the Quaker granola. Nice! I wasn’t thinking too clearly when I bought my first set of ingredients. Specifically, I should have bought the largest container of oats that I could find, rather than the smaller canister. This will reduce the cost-per-ounce significantly! My best advice here is that if you know that you will always use a specific ingredient (such as peanuts), buy in bulk. It will make subsequent batches much cheaper. Also, you can significantly reduce the startup cost by using a cheaper oil. I prefer Canola oil, but if you use vegetable oil, you can save a buck or two upfront. Obviously, eliminating wheat germ from the ingredient list saves a lot of money at first, but by the time you reach the twelfth batch, the differing costs-per-ounce is negligible. Since a jar of wheat germ will fuel an almost-limitless number of granola batches (and is healthy to boot), I think it’s worthwhile to include it. I should also mention that you may already have many of these ingredients in your cabinet already, thereby greatly reducing your startup cost. At the non-optimized price I paid for the ingredients, I’m breaking even with the Quaker brand by the sixth or seventh batch. After that, it’s all extra money in my pocket – a couple dollars for every batch we make. Plus, we have the added benefits of flavoring it to our tastes AND knowing exactly what is (and isn’t!) snuck into the ingredients. No hydrogenated oils or high-fructose corn syrup here. These reasons alone make it worthwhile for us. If you don’t eat A LOT of granola, I doubt it’s worth your time and money. 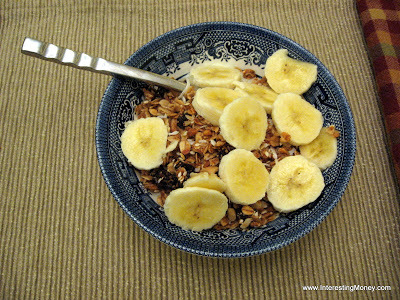 If any of you fellow granola fans give this recipe a shot, let me know how it goes for you. Enjoy!